Denver is now home to three “high-intensity activated crosswalk beacons,” or HAWK signals, to make crossing safer for pedestrians. More are on the way. The first, installed by Colorado DOT at I-70 and Pecos Street, has been around awhile. The two newest ones are in denser residential and commercial areas, both in Stapleton — at the intersections of Martin Luther King Jr. Boulevard and Galena Street and at East 29th Drive and Galena. The signal flashes yellow immediately after someone pushes the button. It then turns solid yellow, signaling to drivers that they should prepare to stop. It then turns red and, ideally, drivers stop. The signal eventually begins flashing red, and drivers can proceed after people have crossed and are safely on the sidewalk. Evergreen Development and the master developer for Stapleton, Forest City, picked up the tab on these signals, a Denver Public Works spokesperson said. DPW will install two more HAWK signals in the coming months — one along Morrison Road in Westwood and one at Green Valley Ranch Boulevard and Walden Street. 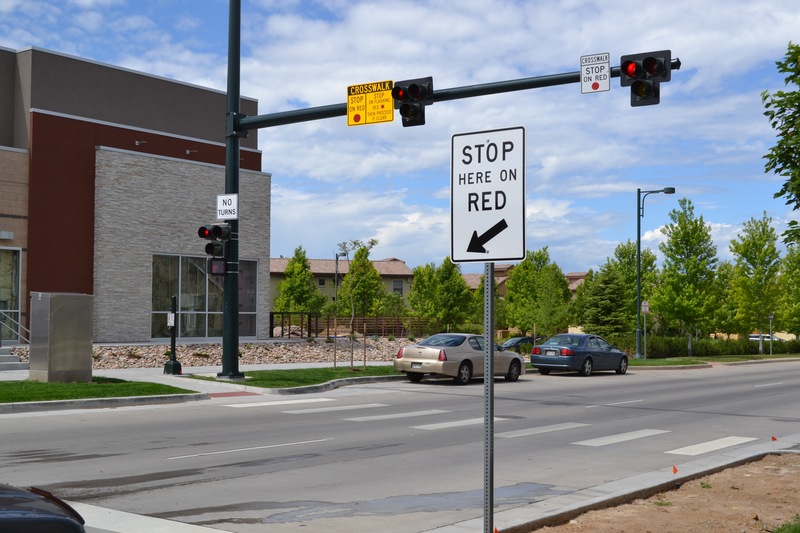 There are certainly less wealthy neighborhoods than Stapleton, with more dangerous intersections, that deserve these signal, which cost just $150,000 a pop (compared to $300,000 for standard traffic lights). More, please, and faster. I’ve only ever experienced one of these. They’re kind of goofy. A crosswalk was installed mid-block so people could walk between Scottsdale Quarter and Kieland Commons shopping areas. After a nice family meal of good Mexican food at the Quarter we came around onto Scottsdale Blvd to this light that was blinking red so I stopped.Others also stopped some didn’t; it was chaotic. BTW, there were no walkers in sight. Then I happen to read the sign that said blinking red doesn’t really mean stop. That’s goofy IMO. The mid-block crosswalk was a great idea in that area but the light after being red should maybe go back to yellow briefly, l dunno. I’ve been through there a number of times and there’s never a problem with people stopping. It’s the blinking red that confuses people. It shouldn’t be confusing. The sign clearly says what to do on blinking red, which is no different than any other blinking red signal. Well, yes, true… and like anything, after you’ve done it a couple of times and know what to do it’s Easy Peasy. Can my gut be wrong? It’s telling me the Rockies will win today. It shouldn’t be confusing, but it seems to confuse a lot of people. I would rather see a normal red light, it’s clear that drivers must stop and can’t go until it changes. I’d rather err on the side of clarity and safety.